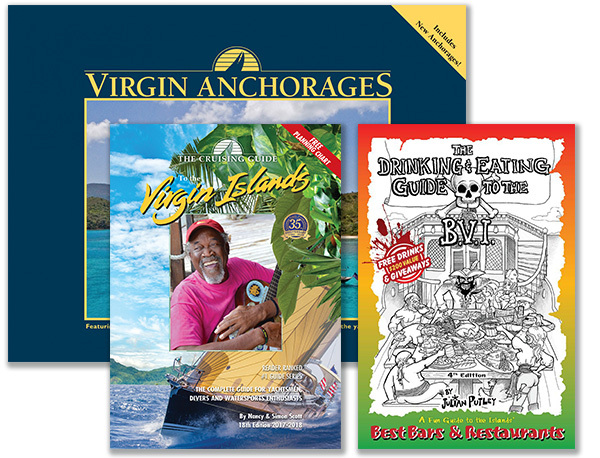 The 2012 edition includes new anchorages, new photography, and updated information.Virgin Anchorages features stunning color aerial photography of 46 of the most popular anchorages in the Virgin Islands. Graphic overlays aid in navigating to safe anchorages. This is an excellent companion to Cruising Guide to the Virgin Islands. From the back cover: This is the fourth edition of the Drinking Man's Guide and is now more appropriately named the Drinking and Eating Guide to the BVI to include some of the better eateries in the islands. Each bar/restaurant has been invited to submit one or two of its specialty dishes with a description or recipe of the same as well as the specialty drinks and recipes as before. And the good news is that most of the establishments have offered to GIVEAWAY a tasty treat or a FREE SPECIALTY DRINK to entice you in to enjoy the FUN. Some restaurants even offer a FREE bottle of WINE with dinner. What could be better, after all Hemingway said it best, quote, "A day without wine is a like a day without sunshine." There are one-liners, witticisms, cryptic comments sprinkled throughout the book but the star attractions are probably the very creative cartoons by talented graphic artist Hannah Welch. The cartoons illustrate the limericks that are associated with each bar and to add to the mix there are short stories of a Caribbean flavor. The whole melange is designed to make a great souvenir of your Caribbean adventure. Even so it is to be feared that most people buy the book for the freebies rather than the literary brilliance of the authors.